It is supposed to be spring here in New England, but it isn’t really. It snowed yesterday a bit though it quickly melted. 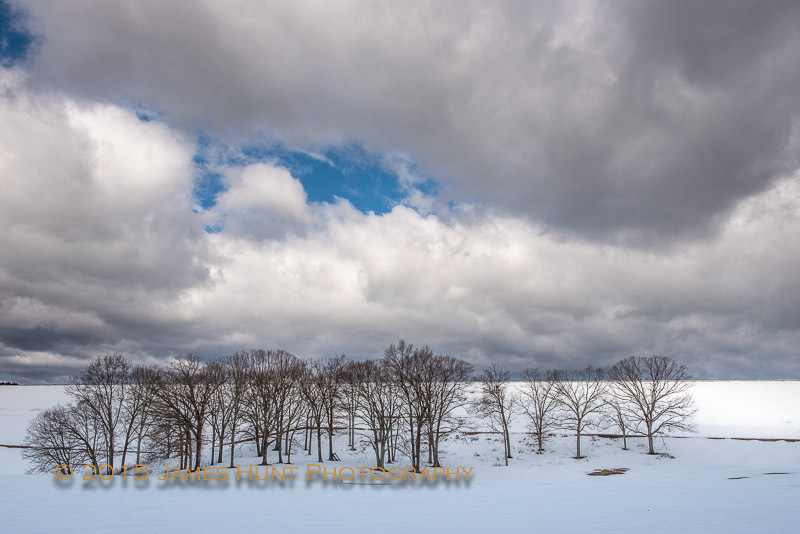 The wind howled last night, but it has calmed down today, leaving us with a new burst of unseasonably cold weather. This is global weirding, though some claim it is proof that there is no global warming. The earth looks flat from where I sit but it isn’t. When they started the Iditarod in Alaska, they had to import snow to Anchorage. But it remains cold here. Nevertheless, we went out on two occasions in an effort to look at the landscape in a different light. We were cold, but not disappointed. 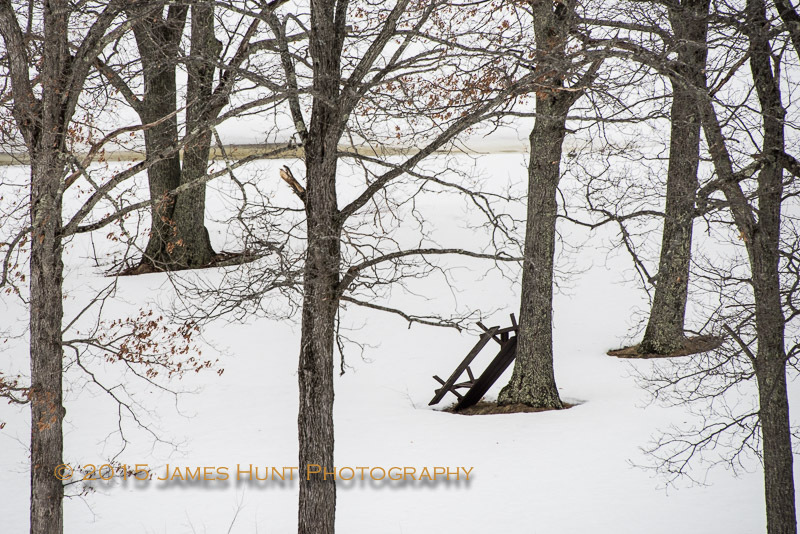 Some photo thoughts from late winter at the Quabbin. First at Goodnough Dike. 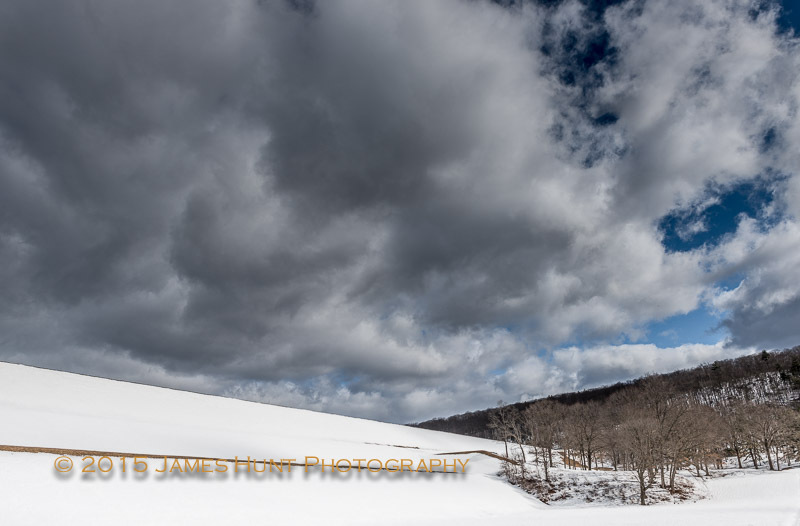 It proved to be too early to be able to look at the story underneath the snow at Dana Common. But the light was working with the trees, juxtaposing old and new. These old trees have seen a lot. They seem to be saying that they aren’t finished just yet. Though some seem to be close. 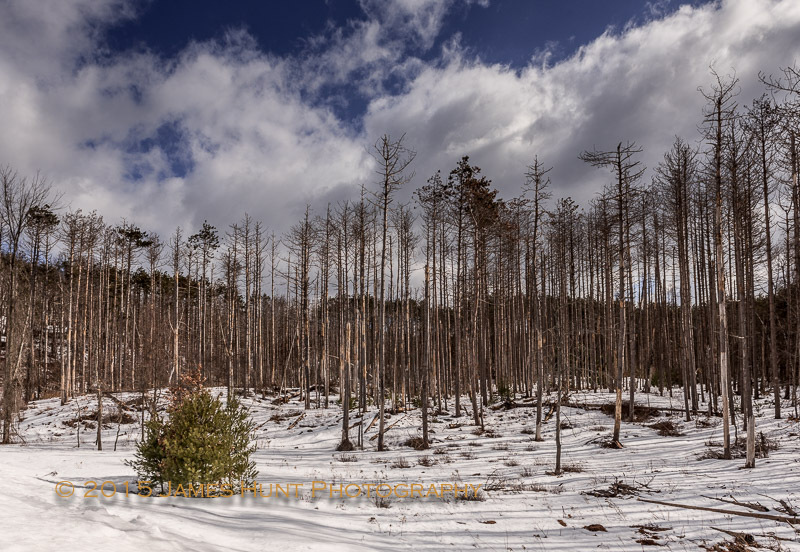 And some, such as these red pines (below) at the Spillway, are gone, but the late winter light tells something of what remains of their story. So it is late winter. Happy New Year. I hope you had a nice Holiday. We did. Lots of family gatherings which was great, but we did make some time to get out and do some work in the field. The weather was nice for the most part and not terribly cold, till the last few days. That was very useful because of an ongoing project that has my attention, on the spiritual nature of the Quabbin Reservoir, or perhaps I should say, its spiritual impact. 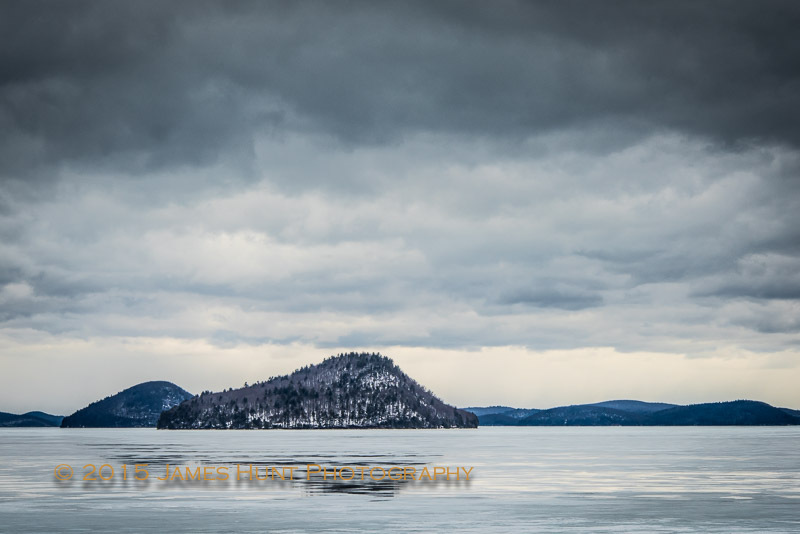 (If you’re new to the blog, click on the key words below and you’ll be guided to a few posts that will give you some background, or of course, just “google” Quabbin Reservoir.) As an accidental wilderness with historical as well as environmental importance, it has a way of bringing people into the fold. I happened to bump into another photographer at Gate 30 last week, a terrific wildlife shooter, who had gotten the bug a year or so back and now went out there whenever possible. I’m not just referring to photographers, though. Far from it. We’ve run into people from all walks of life who have been captivated by the experience of being there. They often have trouble putting that feeling into words it seems. But as a photographer, I approach the question visually of course. 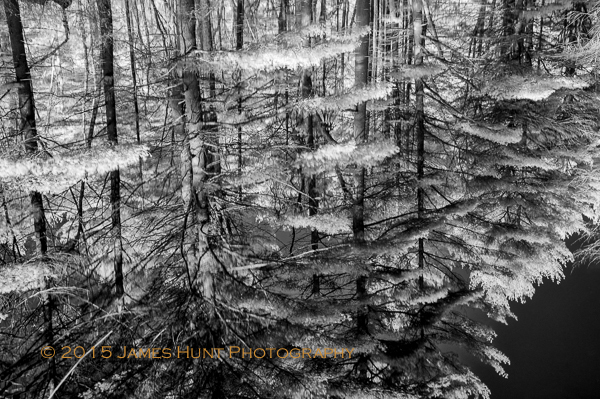 While the ice can be a terrific subject, I’ve been focused more on the relationship between the water and the forest. Gate 37 in Petersham presents some wonderful opportunities to explore this relationship. 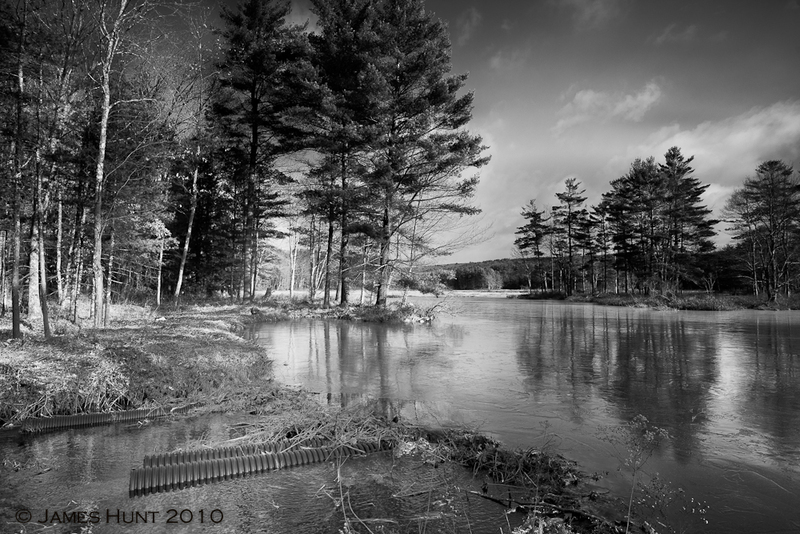 Here Fever Brook, which runs through the Federated Women’s Club State Forest on its way to the Reservoir actually meets the Reservoir. The local engineering firm, Beaver and Beaver, has taken it upon themselves to create a rather large pond here. 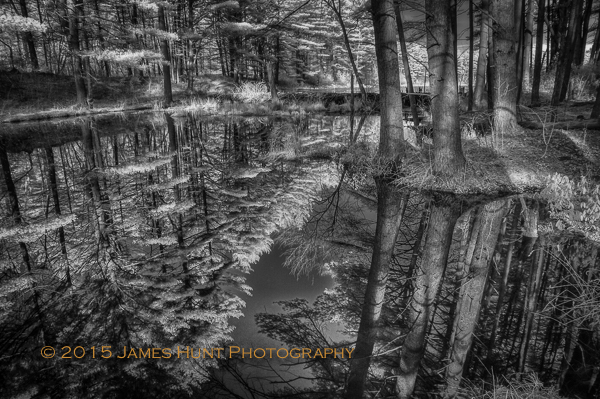 The reflections are stunning and give one the sense that the water and the forest are conversing. As I’ve mentioned a few times, I was unfortunately ill during part of 2014 and was far less active in the field than I had hoped. Things are better now and I hope to be a bit more productive. We have much to be grateful for. 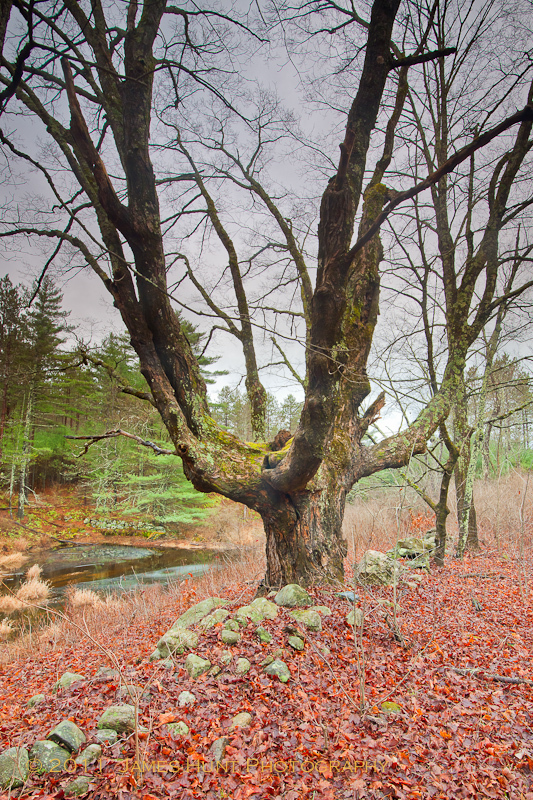 One of the spiritual tugs I feel when I visit the Quabbin is that of gratitude. I’m terribly appreciative of the fact that I get to go to such wonderful location, that the Reservoir not only provides us with both water and air, as if that wasn’t enough. It gives us an opportunity to be grateful for the sacrifices that others make on our behalf. We’re looking forward to 2015. Happy Thanksgiving to those in the U.S. It has been a tumultuous and difficult year in some ways, but we seem to be making it through. It has been dry here, in response, in part, to our changing climate. However, we had a beneficial day long recently which suggested that the water would be flowing, and indeed, it was. 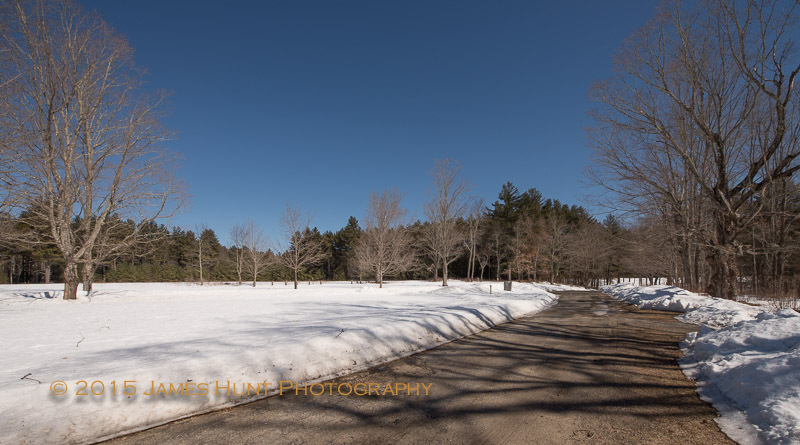 We made our way to the Swift River Reservation, a wonderful and important property owned by the Trustees of Reservations, in Petersham, Massachusetts. How important? 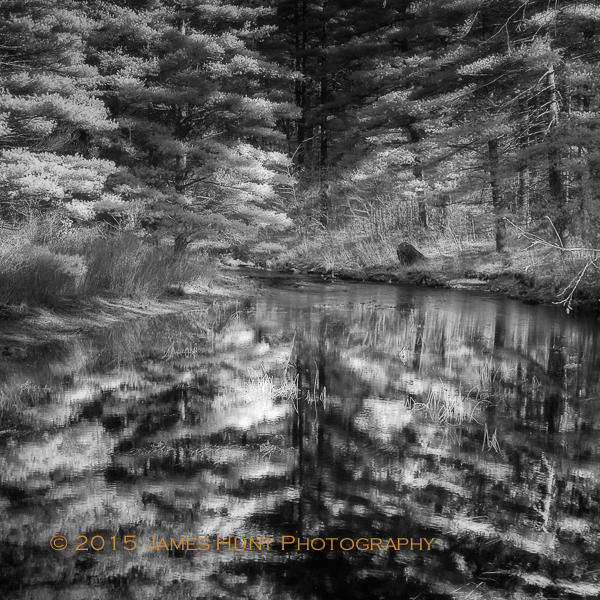 A good deal of the water that flows into the Quabbin Reservoir runs by this point. 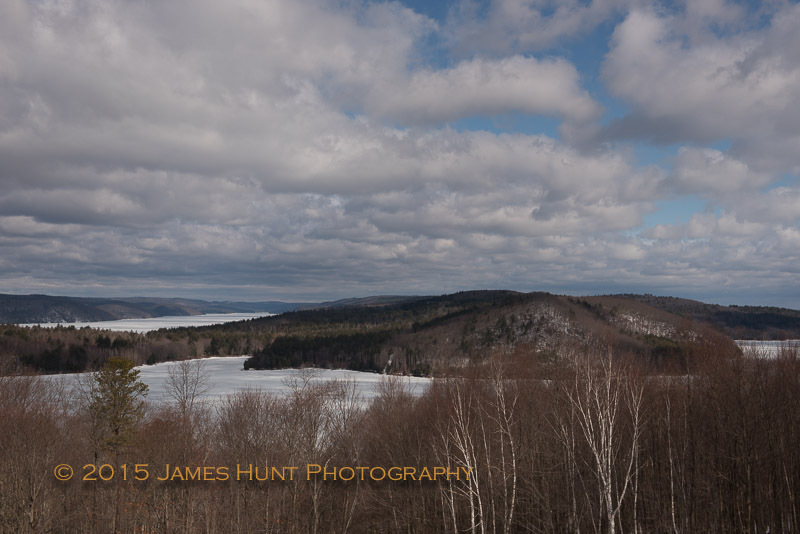 The Quabbin Reservoir supplies the drinking water for about two million citizens of eastern Massachusetts. It is essential to their, our, well being. 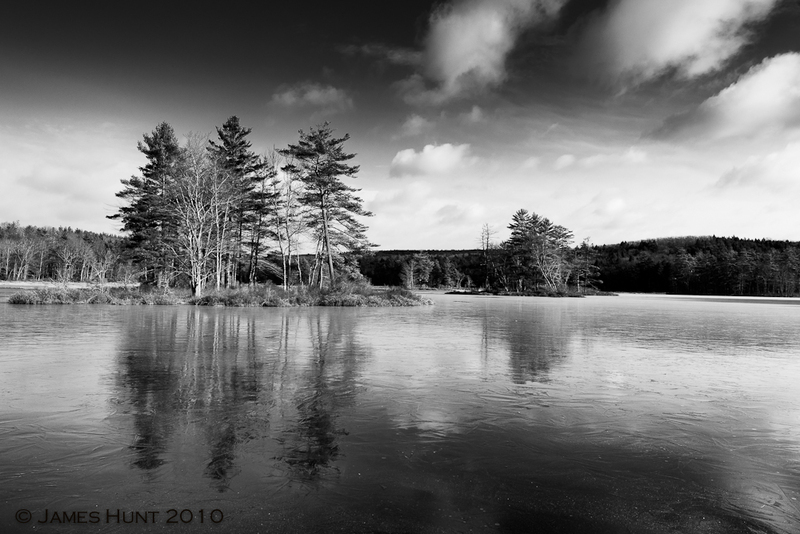 The Eastern Branch of the Swift River dumps into Connors Pond, and then moves south into the Reservoir. It is just off Route 122. 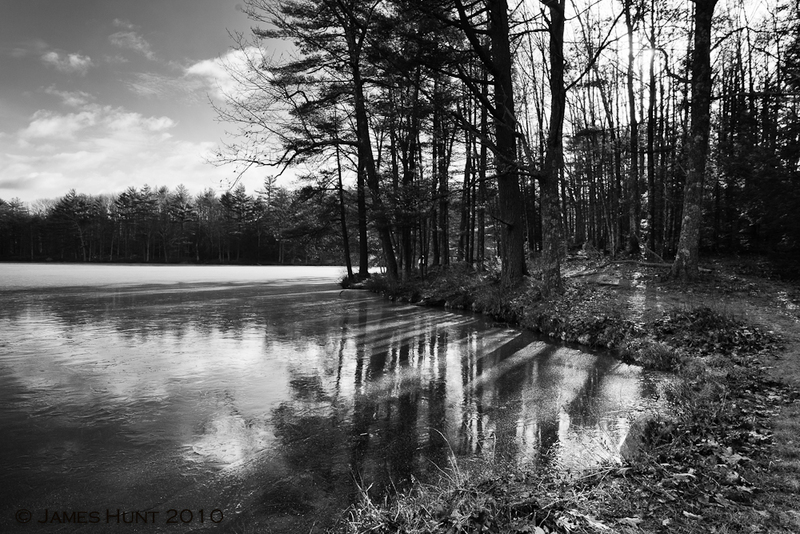 When we got there, we found an amazing cornucopia of running water, reflections, forests and ice cycle structures. Like so many great but intimate locations, it was too much of a good thing. It is eye candy if you’re just looking. Not so much if you’re trying to make a good photograph. You can see the water flowing over a “dam” of sorts, as it is leaving the Pond. 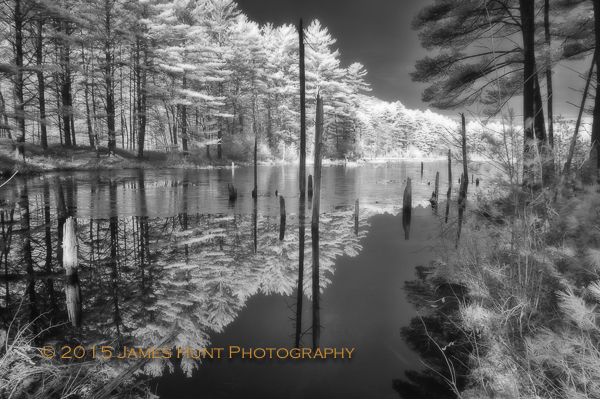 The reflections were wonderful, but difficult to position. You might try standing on your head to view this one. The basic problem is that the forest surrounding the flowing water creates a massive set of distractions. The only approach that, sometimes, thankfully works, is to isolate interesting components of the scene with a longer lens. That was more satisfying. 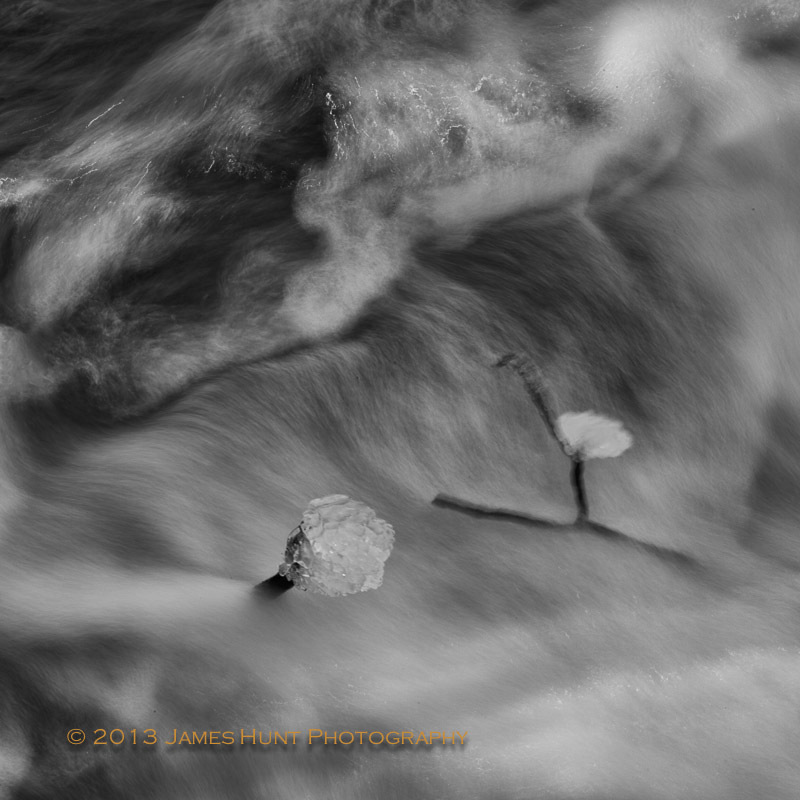 I am always amazed at how little chunks of ice debris can withstand the onslaught of a river. These two are gallantly fighting on. 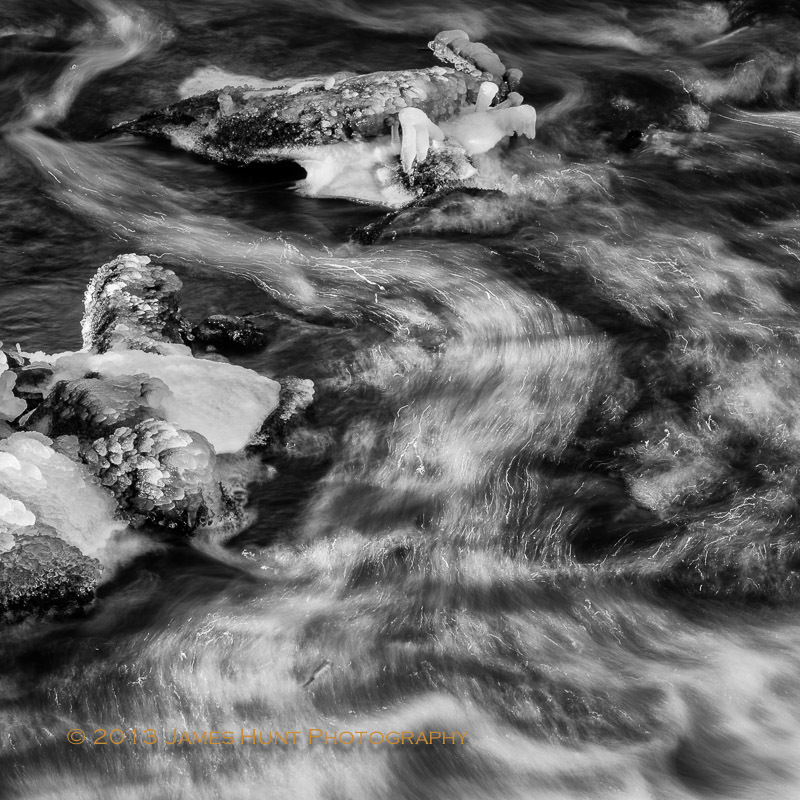 I am using a longer exposure here to capture the movement of the water. 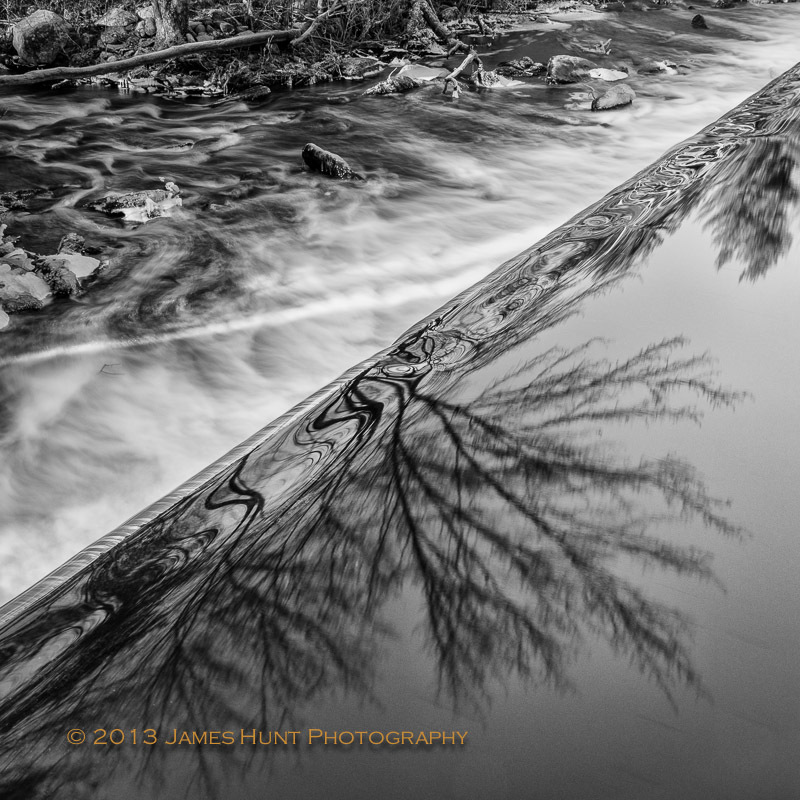 The longer exposures reveal patterns of water flow as the water moves through the rocks and mud. These are patterns that like so much of nature are often invisible to us, unless we care to look a little harder. You may learn something if you do, however. For starters, it’s a lot of little things that matter. This place, though and our water, add up to something big, for which we should be quite thankful. In many parts of the world people would die for this stuff. We are exceedingly lucky. The Holidays of course remind us of what is important, who and want matters to us. Nothing lasts forever, no matter its importance. I’m a big fan of trees, as anyone who read this blog will know. Though I appreciate all trees, I’ve got my favorites. 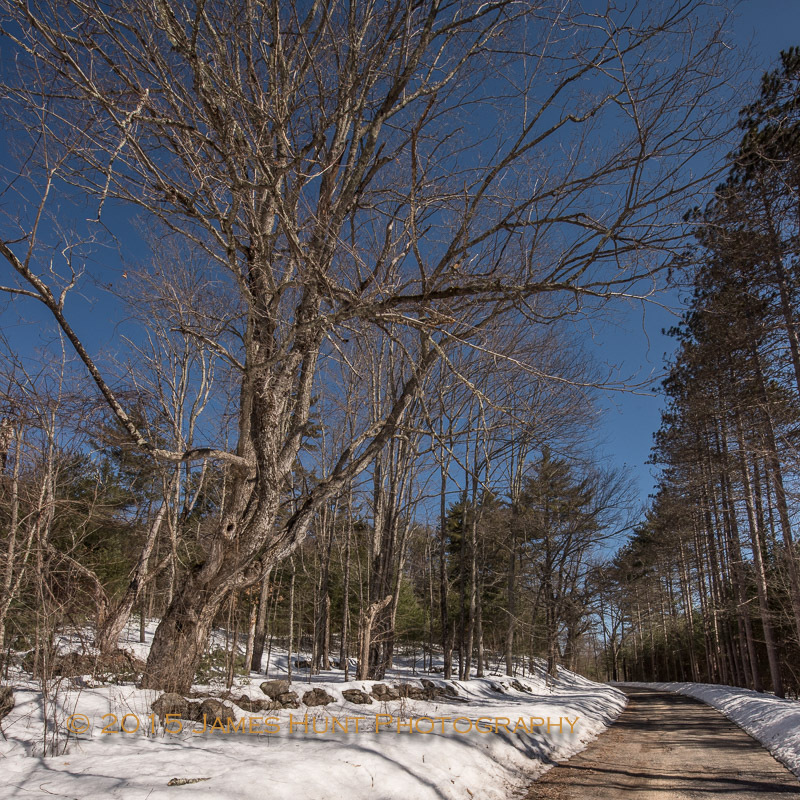 The road from Gate 41 at the Quabbin Reservoir in Petersham, to the water is one of my favorite, very short walks because of one tree in particular. It may not look like much, particularly in the winter. 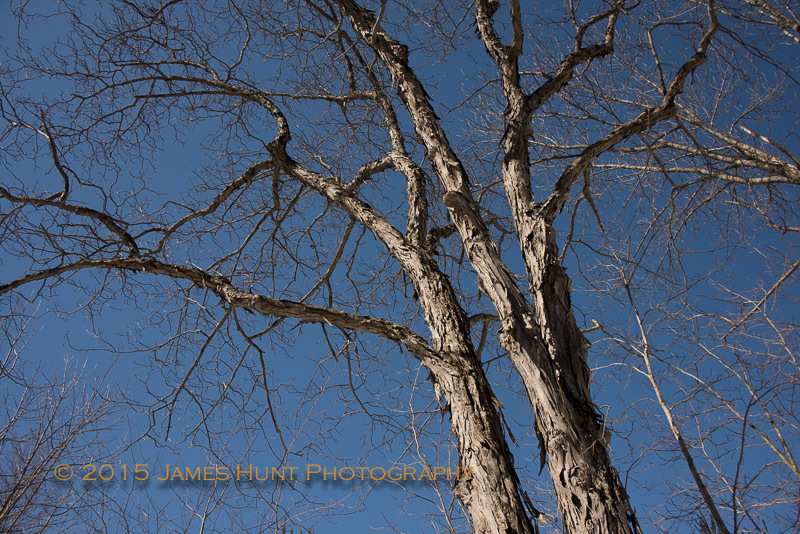 But a closer look at its branches gives one a sense of real strength, at least it does so for me. It’s circumference is way over six feet. 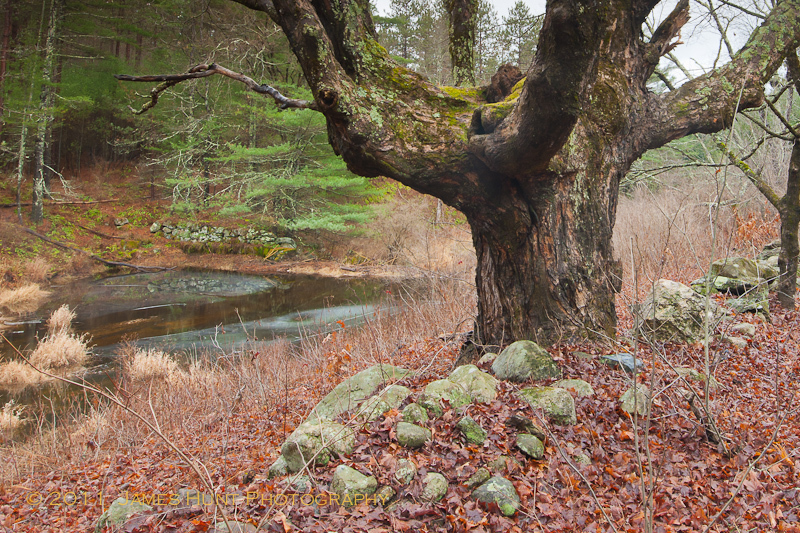 You can’t really tell the age of a tree without examining it’s rings, but this tree is embedded in a stone fence in what was once the community of Storrsville, which was essentially abandoned by it’s occupants well before the Quabbin Reservoir was created in the 1930’s. I suspect this tree was not only there at the time, but was probably already old. 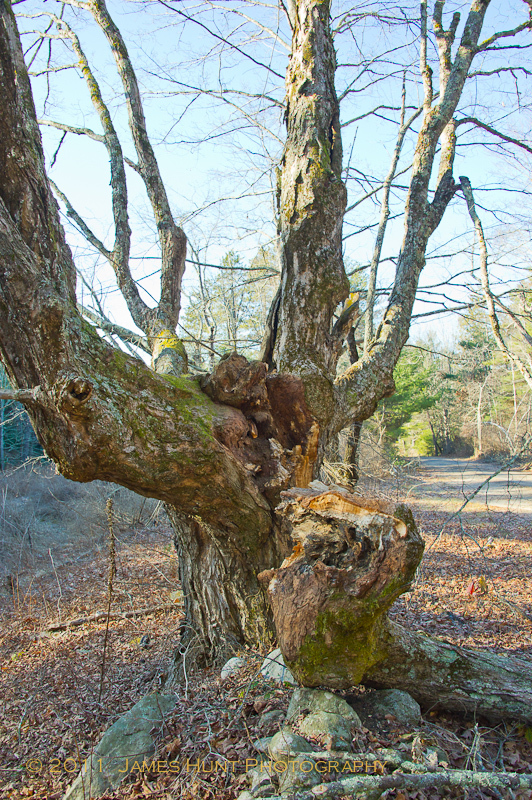 A tree like this can be well over 150 years old, dating it back to the Civil War era. A close up view might explain my fondness for this big guy. 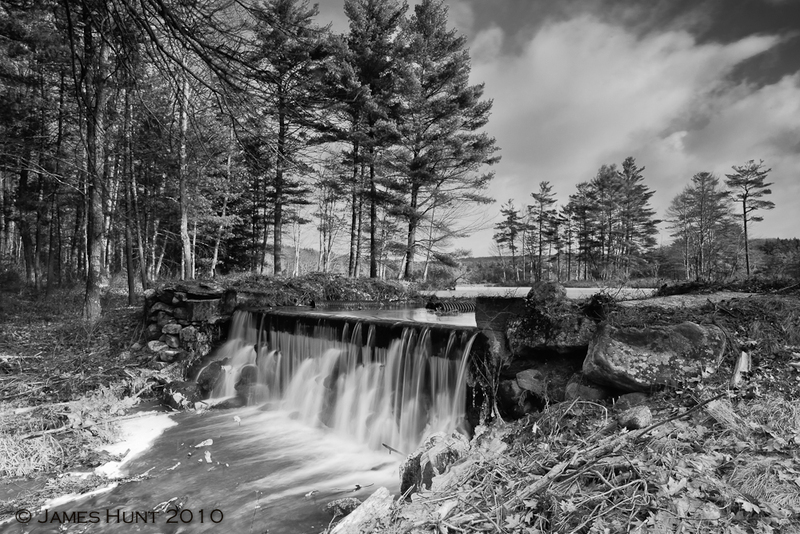 In the background you can see Rand Brook and on the other side of the brook is an old mill dating back well into the middle to early 1800’s. We have seen this tree in all sorts of weather and it is still very much open for business. Loaded with leaves in the summer. So of course, it was still loaded with leaves when the October 31 ice and snow storm hit, a storm that wreaked havoc on trees and power lines. And on our friend here. Will it survive? I don’t know. That’s a big wound. My guess is that it will survive for at least a few more seasons, but wounds allow for infections. The Division of Conservation and Recreation who manage the Reservoir typically leave things wild unless fallen limbs block the road. You could tell that they had in fact sawed and moved off some of what fell. Beyond that, this wonderful old tree is probably on it’s own. I propose then a Holiday toast to what matters. Cheers. 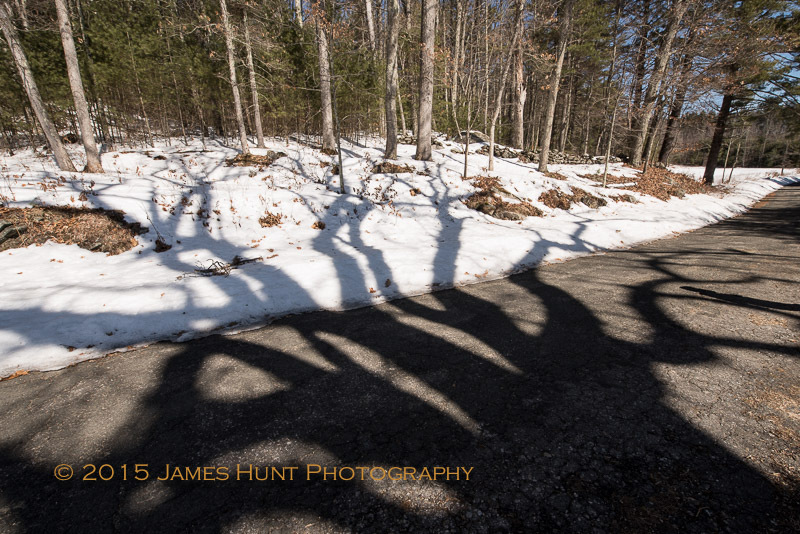 The sun was hiding behind the trees to our south, creating some wonderful shadows and beams. This is an interesting forest. It was largely decimated by the Great Hurricane of 1938. Since then though, it has been untouched for the most part, except for some scientific forest management studies conducted by the University. Remnants of character trees are everywhere, making for some good spots for wildlife. We’ve stood on these shores and seen otters in the past, alas though, only when the camera was firmly affixed with a wide angle lens. Those are beaver deceivers, designed to frustrate the little engineers. 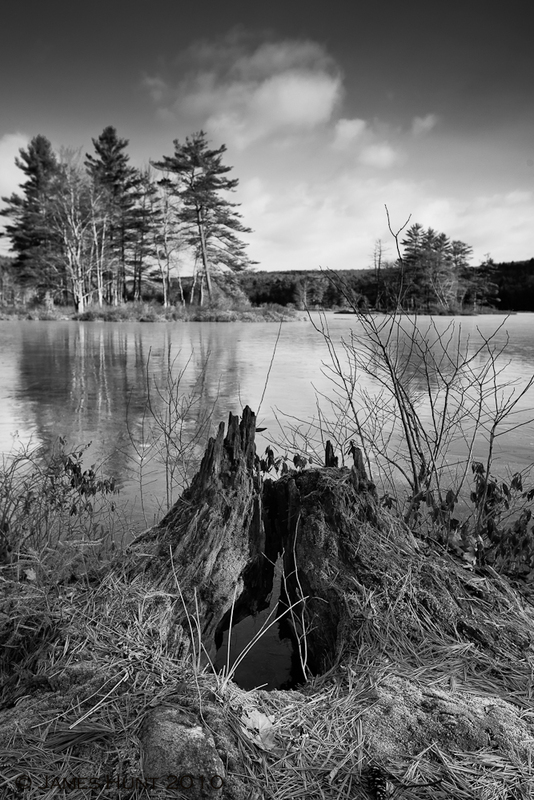 I guess the folks at Harvard Forest are happy with the current water level. It’s always about the water in these parts.